I suppose now would be a good time to mention that I have never done this route before, so the next three missions will be completely new to me. 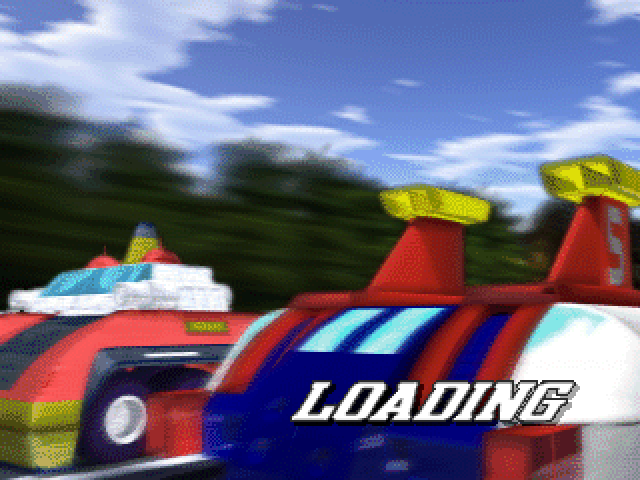 : Alright, prepare to receive them. : Just three of them...? 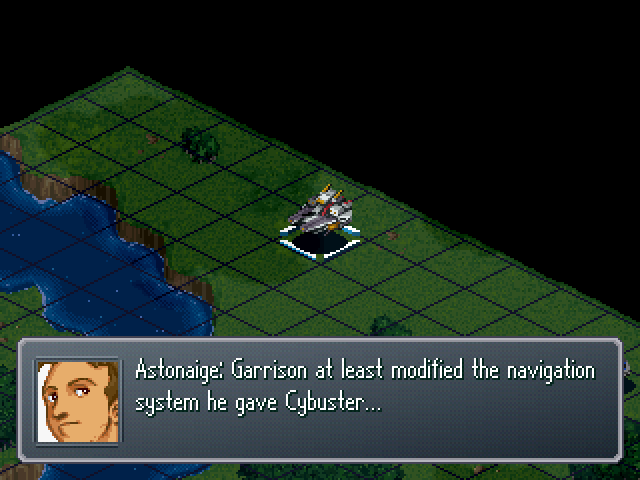 : But Cybuster's the most suited to long range reconnaissance. : Which means nothing if he can't find his way back. : Heading northward, I assume? : Yeah. There's something going on that way... But let's land for now. 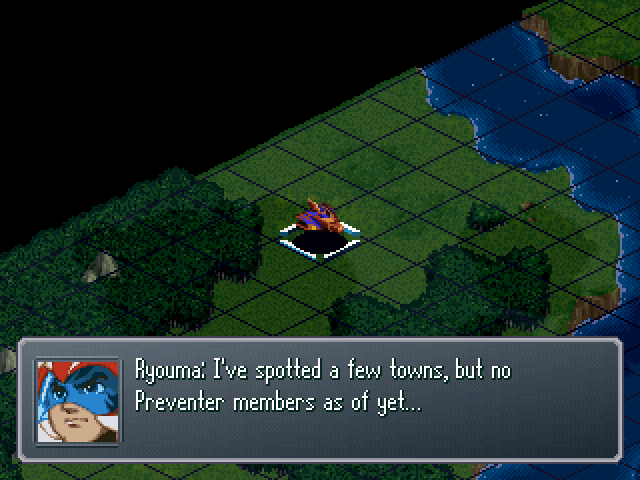 : I found a town similar to the one nearby, but no Preventer machines. 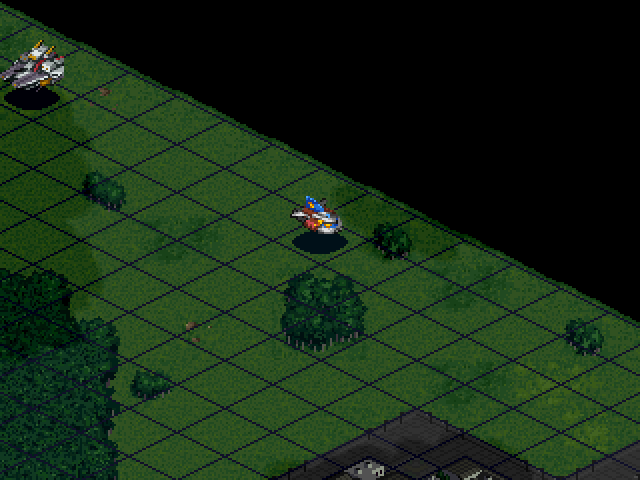 : I just spotted the Borot and a landship skulking around the area. : So our concern is the ship-like object that flew in from outside the atmosphere last night. 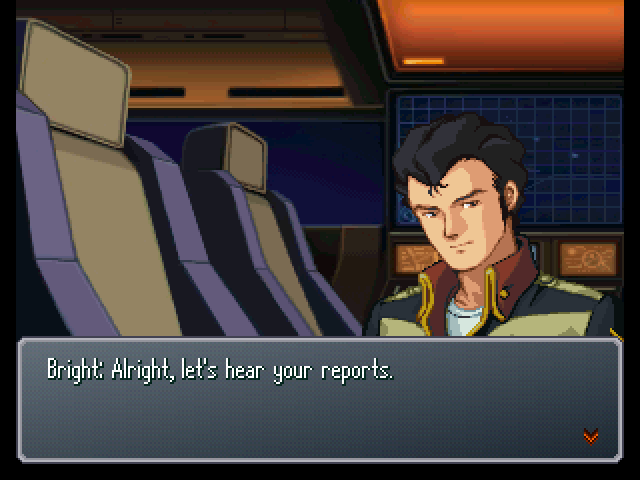 : Kouji, Lt. Emma, Noin, you went to gather information at the town nearby, right? Did you find anything out? 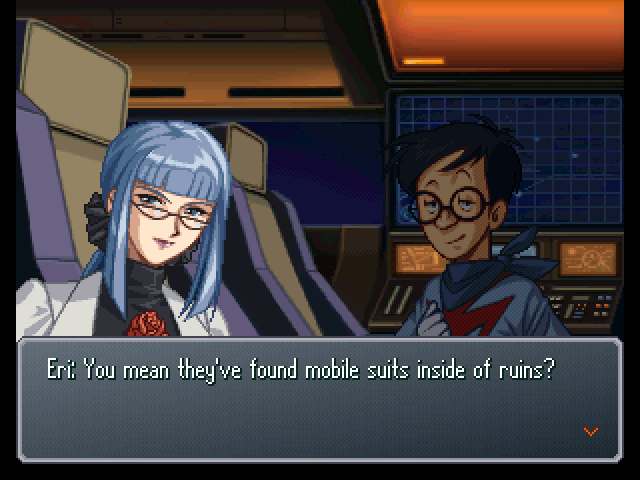 : And... You might not believe this, but...There are apparently mobile suit-like objects being excavated from a mountain to the east. : What did you say...? : Yes. Have a look at this photograph from the town newspaper. : A Kapool, a mobile suit designed by Neo Zeon for aquatic environments. : And these have been excavated, you say...? : The future, huh... This ruined world is our future...? : There's one other thing that caught my attention. : Have a look at this photograph. : This goes with the article titled White Doll? 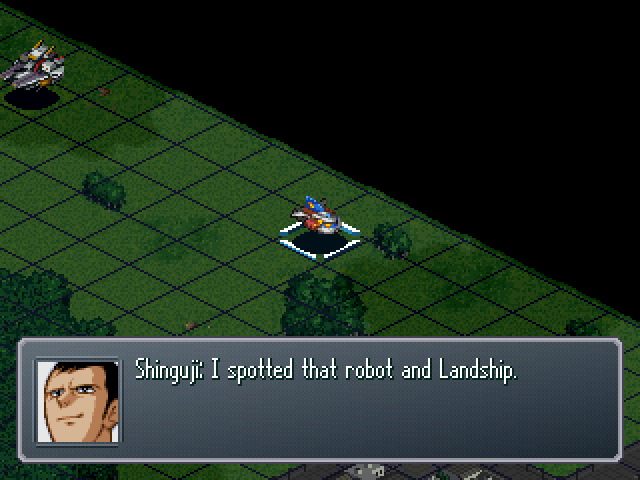 : A Gundam...? No, the head is shaped differently. : At the very least, it's not a machine from the Space Era. : That's also puzzling, but... Look closely at the silhouette in the background. 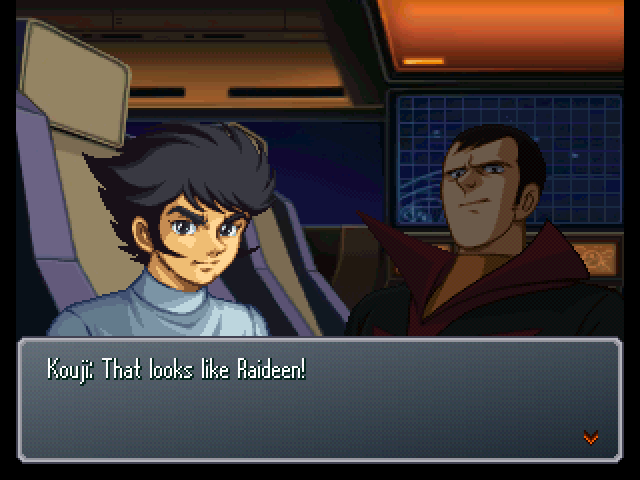 : Yes, it's Raideen. Judging from the composition of the picture they appear to be fighting alongside one another. : What's wrong? Did I say something wrong...? : ...We're irregular influences on this world. We shouldn't take any unnecessary actions. : What...!? Are you saying that we shouldn't go help our own!? : We have precious little information about this world as things stand. 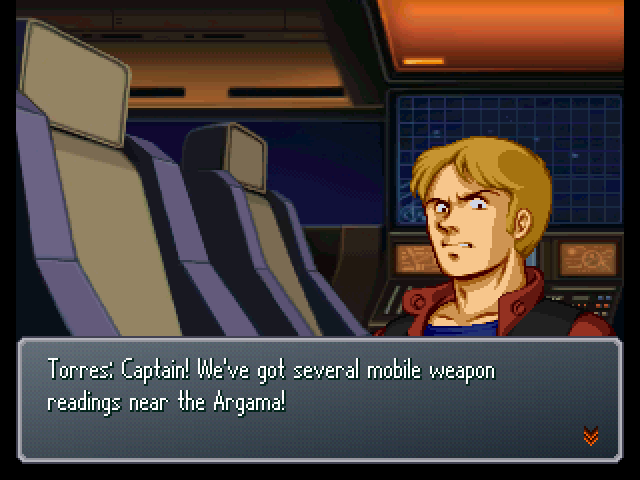 We shouldn't make any careless moves with the Argama, given how much it stands out. : But we don't know where Sayaka, Tetsuya, Musashi, or any of the others are, either! : Here we've finally managed to track down Akira and his group, and...! : I never said we can't help them. We just need to do some investigating first. : But what if something happens to them...? 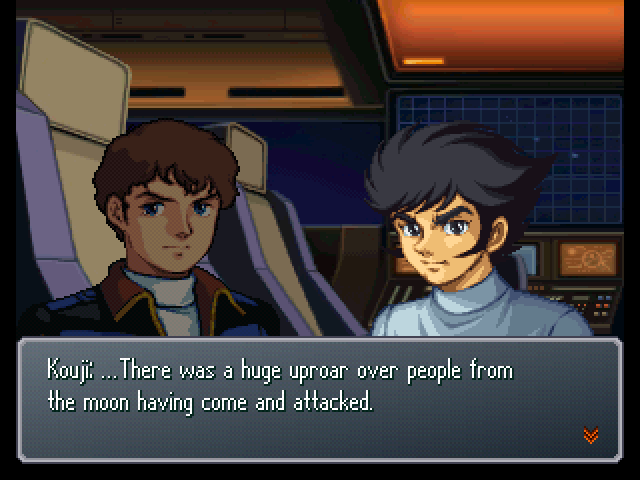 : Kouji, I know how you feel, but there's some kind of battle brewing in this world. If we get caught up in it, our situation will only get worse. : Is that any reason to abandon them!? : We wouldn't have done it that way in the old Londo Bell! You guys have all grown so coldhearted since forming the Preventers! : ...You're as shortsighted as ever, I see. The situation isn't that simple. 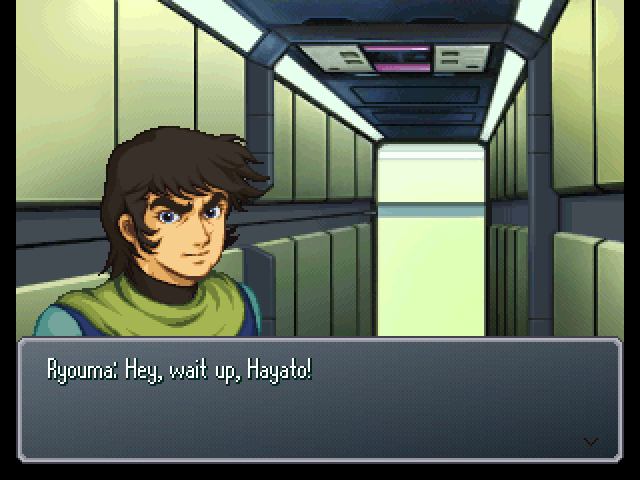 : What's that supposed to mean, Hayato!? : Heh... You just don't get it. : Then spell it out! : Look. What we do can lead to completely unexpected consequences. : But the fact remains that our actions triggered what happened afterwards. : That's why you have to act discretely when you can't see the whole picture. 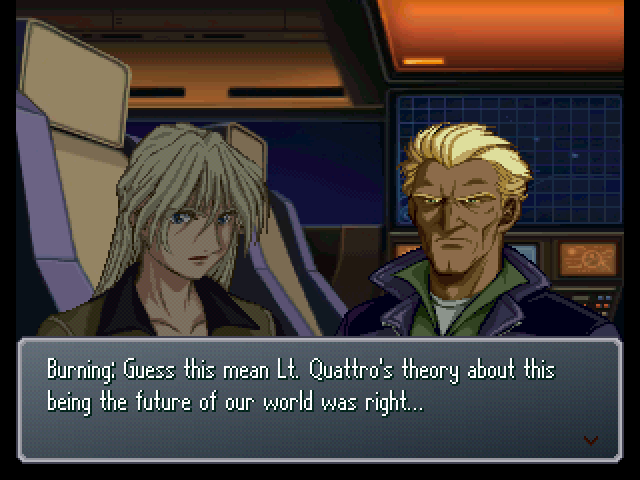 Lieutenant Quattro isn't wrong. : People who refuse to grasp that have no business involving themselves in the fights we'll be facing. : Hey, I didn't ask to hear your badmouthing! 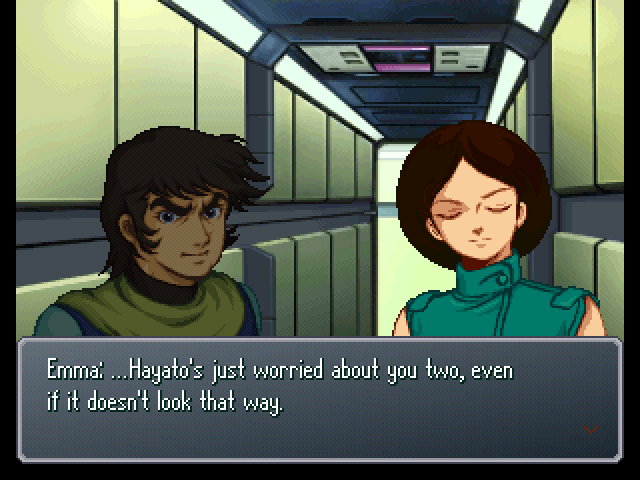 : He's right, that's going too far, Hayato. : That's enough out of all of you. Keep it up and it's off to the brig. : At any rate, the Argama will remain here until we get more information. 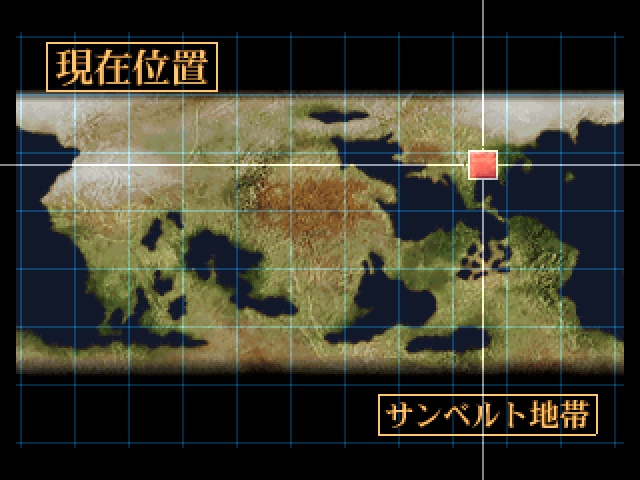 : Sarumaru, Dr. Anzai, if you could investigate the surrounding area? : Also, Lt. 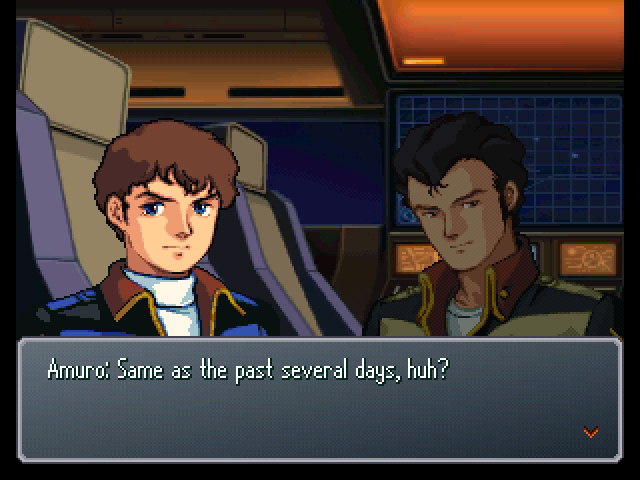 Burning, Lt. Quattro, you handle forming a new recon team. : To check up on Raideen, right? I'll go this time, then. : Lieutenant, the Hyaku Shiki Kai's overhaul will be finished soon. It should be available for use after that. : Alright, then I'll wait for that to be finished. 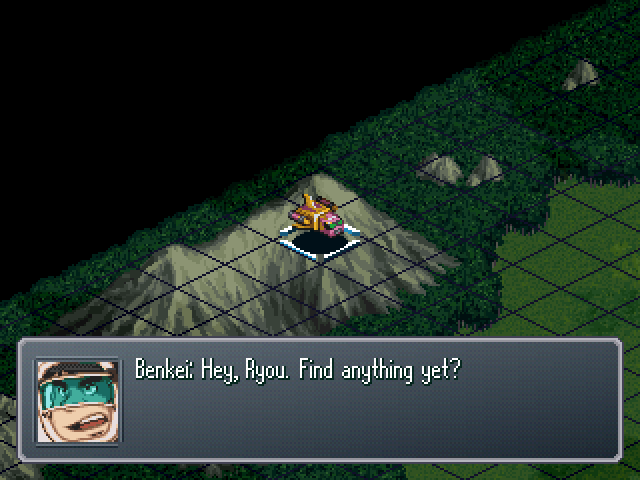 : What do you want, Ryou...? 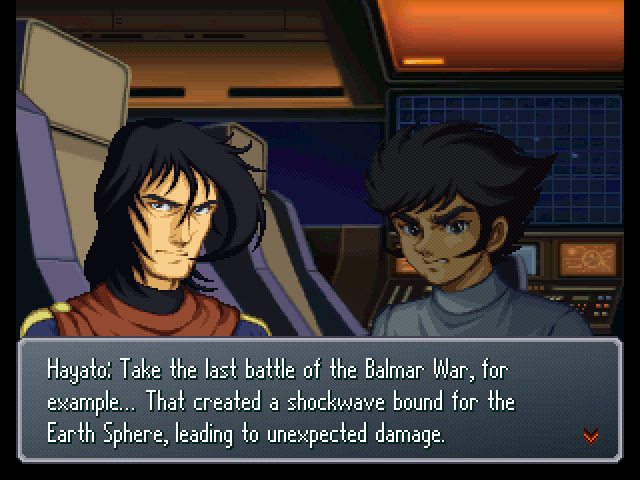 : What's the matter, Hayato? Has something happened? : What...? Aren't you the least bit worried about Akira or Musashi's groups? : (.........) Heh... If you and Kouji keep letting your bleeding hearts get the best of you, you won't live long in this world. : Besides which... This isn't the Space Era. He always talks about how things should be handled with discretion. : ...I know that. We've been together a long time. 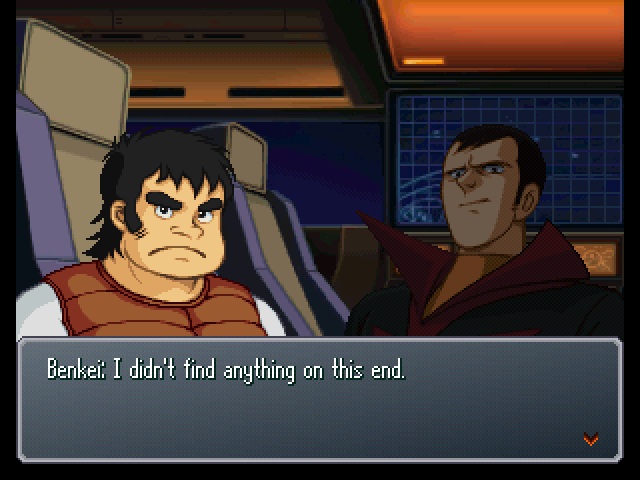 But I see where Kouji's coming from, too. : I'm well aware that our power could upset the balance of this world...But in the old days, that wouldn't have been any reason for us to hesitate to help a friend in need. : Protecting both the world and our own... Wasn't that what the Londo Bell was all about, Emma? : But we're the Preventers now... A lot's changed. Things aren't the way they used to be. : Of course we're not going to abandon our own people, but we have to think and act with care. If we use our forces the wrong way... The results could be disastrous. 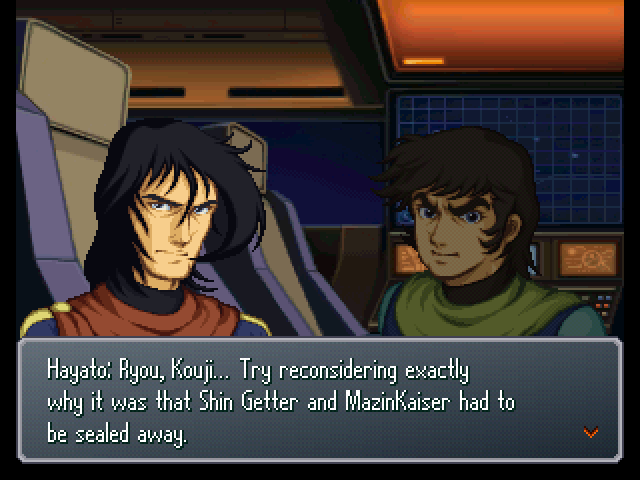 : Didn't you seal away Shin Getter Robo for the same reason? : Are you irate that a pilot has to perform lookout duty? : He obviously got in an argument with Hayato or Shinguji. : H-how'd you figure it out? 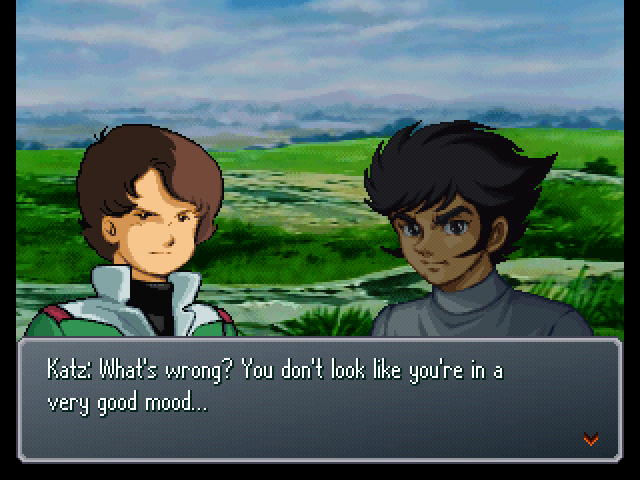 : You're just like Kamille, your face is a dead giveaway of what you're thinking. : Shouldn't you hurry up and make up? : I don't know what you were arguing over, but... Times like this are when we need teamwork the most, I think. : (...Act discretely when you can't see the whole picture, huh... I guess it's true that you never know what'll happen in a place like this...) Oh, by the way... Is Masaki back yet? : Guess it's about time we sent out a search party for him, huh. 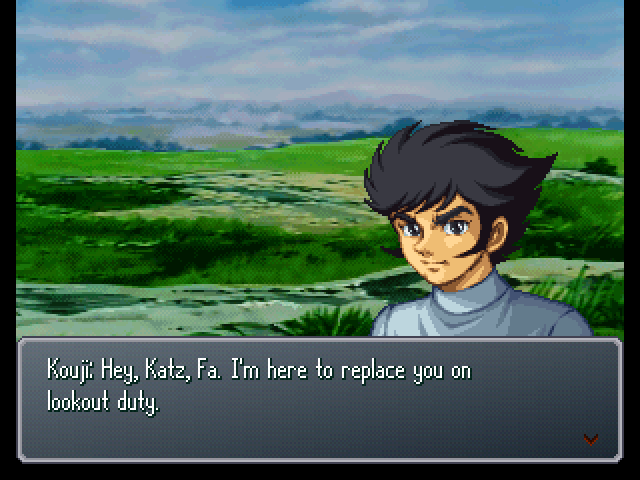 : What is it, Katz? 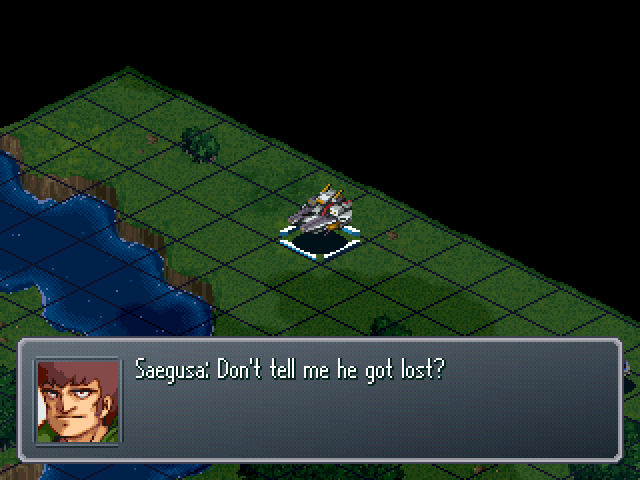 : Kouji, something moved in the woods that way. : Mobile suits...? No, that's not it! : H-hey! Those silhouettes... Don't tell me they're...!? : All hands, level 1 battle stations!